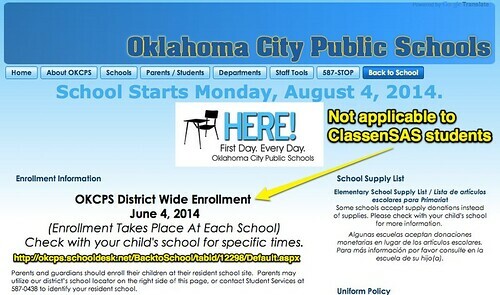 OKCPS will be having a “District-wide enrollment day” on June 4, 2014. A “robo-call” was sent out this morning to ClassenSAS parents that this district enrollment day does NOT pertain to ClassenSAS students. Students at ClassenSAS and accepted through the application process are already enrolled and do NOT need to re-enroll on June 4th. Dr. Ashley Davis, our ClassenSAS principal, attended last night’s PTSA board meeting in the school library, and shared this update with parents in attendance. The “robo-call” was sent out today to make sure everyone attending ClassenSAS is aware that students do NOT need to re-enroll on June 4th. If you did not receive the “robo-call” this morning, you can subscribe to these updates by downloading the free OKCPS “School Connect” app and choosing to receive phone call updates.